The River Kennet flows through the urban centre of Reading and is fed by a number of brooks, each one important in its own right. It is joined by the Silchester Brook just south of Mortimer and the Clayhill Brook east of Burghfield. In its lower reaches, below the M4, it has been modified by straightening and dredging as it flows through the industrial area of south Reading. It receives the outfall from the Sewage Treatment Works at Reading which reduces water quality. The invasive plant species floating pennywort is a particular problem in the lower reaches. Part of it flows underneath Reading town centre before rejoining the Kennet by Reading Abbey. It powered the watermill of Reading Abbey, hence its name of the Holy Brook. A side stream of the brook runs into the Kennet again at Calcot and also powered the Calcot Water Mill, which was owned by Reading Abbey. Some parts of the channel are natural, whilst other parts were created in medieval times to supply water to water mills and fish ponds. The Holy Brook is part of a network of streams which drain the Kennet Water Meadows, one of the few remaining areas of open countryside close to the centre of Reading. 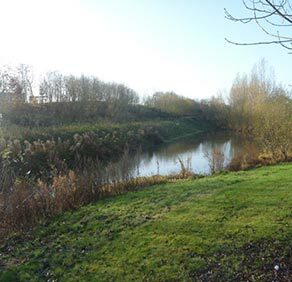 The area is an important, accessible open space, valued for both wildlife and recreation: walking, fishing and bird watching. The Holy Brook is recognised as a key spawning habitat for coarse fish, particularly barbel and chub. These brooks are southern tributaries of the River Enbourne. All except the Baughurst Brook rise on chalk, and all are important fish spawning streams. 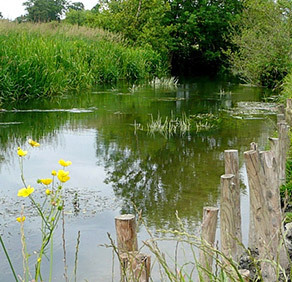 The Kingsclere Brook supports a small population of wild brown trout. Ecchinswell Brook flows into the River Enbourne. It is a significant stream, rising on chalk and is accessible by public footpath. Ecchinswell is thought to have got its name from the Latin Eikena meaning ‘oak’, with the village and brook meaing ‘well by the oaks’. It is failing to meet Good Ecological Status but there is little data available about the health of this waterbody.